With so many carb heavy dishes for Thanksgiving, you might be a little worried about keeping your keto diet. Fear not though, I’ll cover how to stay keto on Thanksgiving. These are very easy tips to follow and also are effective for other holidays and social events as well. Let me know how these tips worked out for you in the comments below! Bring your own keto Thanksgiving dish. There are so many keto friendly versions of practically all of your Thanksgiving favorites. 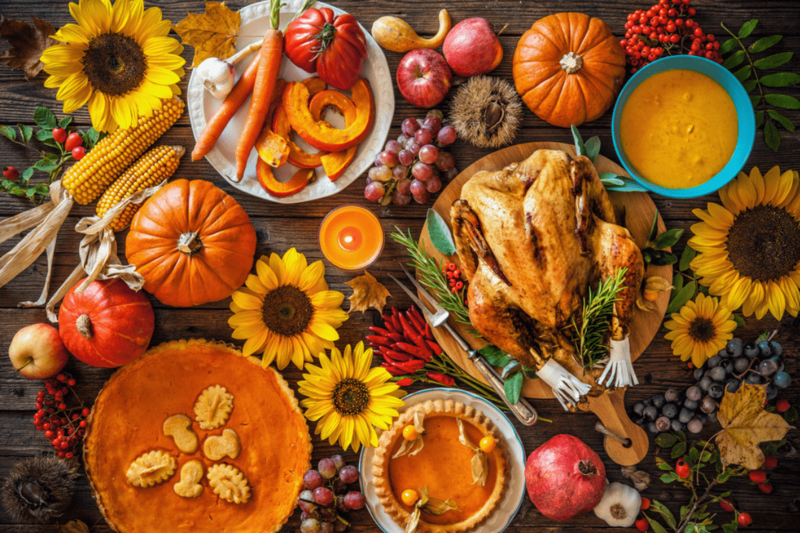 For some great ideas, check out my post 50 Keto Thanksgiving Recipes! These dishes are crowd pleasers and you don’t even have to let on to others that they are keto. I covered everything in the post above: mains, sides, appetizers, and desserts! When you bring your own dish, at least you know you are going have a great ketogenic option to fill up on. If you want to eat more than just the one keto dish that you brought, you need to know what foods to eat and which ones to skip that aren’t keto compliant. Ham, although with caution. Some ham has a sugary glaze, so be sure to ask your host if there is any added sugar. Straight up ham is just fine. For appetizers stick to deviled eggs, nuts or cold cuts and cheese. Salads, although watch out for croutons and certain sugary dressings. You could replace the dressing with olive oil. Cranberry Sauce typically has a lot of added sugar. Sugary mixed drinks, beer and soda. Now some of you may feel a little funny doing this, but you have nothing to be embarrassed about. Many people have special diets or allergies where they have to check the menu out before hand. See what dishes have added sugar. The more you know ahead of time, the better set up for success you will be. Try to make a point to the hostess that they don’t have to make anything special for you, but you wanted to check in ahead of time to see what you could eat. This is also a great time to ask them if it’s okay to bring your own keto dish as well. Eat a small snack before to help you from mindlessly eating. Grab a small snack so you don’t show up starving. This will help you from grazing mindlessly on food just because you are hungry. Walk around with a drink. If you drink wine, red wine is low in carbs (just don’t overdo it). For non-alcoholic options, plain water is always good or sparkling water with a lime or lemon wedge. Having a drink will make you feel full and occupy your hands while everyone else is munching. Try to workout or take a nice fall walk beforehand. There are a couple reasons for this. The first being that you may be less likely to cheat on your ketogenic diet because you don’t want to counteract your workout for the day. Secondly, if you do overindulge or eat non keto foods, well at least you worked out! Take a few moments to visualize your success before you leave. Now this one may be a little new agey, but it works! Before heading out the door, visualize being successful and sticking to your keto diet. Think about how it will feel to leave not overly stuffed, just satisfied. While everyone else the day after Thanksgiving is experiencing a food hangover, you are going be so energetic and ready to have a great day. Say out loud that you will stick to your diet. Go into Thanksgiving with a positive mindset that you’ll stick to your goals. We’ve probably all mindlessly shoveled food into our mouths during the holidays at some point in our lives. Try to slow down when you are eating. Really savor and enjoy your food and think of how thankful you are for this food that is nourishing your body. Note the texture, taste and smell you are experiencing while eating, almost like you are experiencing the dish for the first time. This may sound silly, but it will prevent you from overeating and veering off your keto diet. Lastly, it is okay to slip up. If you end up not sticking to your keto diet, please don’t beat yourself up. It’s the holidays and it happens. Just get back on it the next day and don’t feel guilty. Some of you may consciously decide Thanksgiving is your cheat day and that’s okay too. One day is not going make or break your keto diet. Let me know how these keto tips worked out for you in the comments below!